I’ve been using the Hoo-Rag for a few weeks now, but I’ve been using a similar product for years (the Buff) , and I love them. 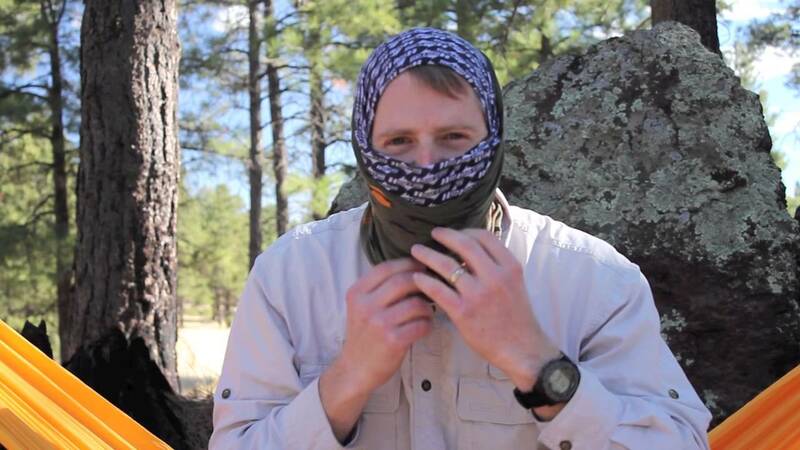 The Hoo-Rag multi-function head gear is useful beyond the easy-on neck warmer: you can bend and twist the microfiber fabric into beanies, balaclavas, head bands, and more. At only 1 oz (28 g), I often carry a couple in my pack, especially as the temperatures cool. The Hoo-Rag is a multi-function head gear made from a blended fabric. The seamless tube of fabric measures approximately 10 × 19 in (25.5 × 48.25 cm) but has a generous stretch to fit over all kinds of body types. I highly recommend this head gear, and I’d like to thank Hoo-Rag for sending me a sample to test! Disclaimer: The author (Derek Hansen) was provided with a free sample of the Hoo-Rag from the manufacturer for testing and evaluation purposes. One of the best reviews ever!!! I agree with Dan… love the applications I haven’t tried with the Hoo-Rag competitor version… I think I’ll rock the ascot tonight! So much more useful than the sling. Would love to see a BSA design on this to get my scouts interested in wearing one. Warning: The vendor’s site is almost unusable, it’s so “tricksy”. It takes awhile to actually find the sub-zero hoo-rag.